i’ve been busy tweaking the blog and - more importantly - sewing lately so never got round to finishing up the entries for the ottobre 4/2003 dress and leggings. the bad news is my fantastic iron-on appliques turned out to be iron-on-wash-off :( it’s not the end of the world as i can run a few teeny stitches around but it takes the shine off a little. next time i’ll try an alternative pressing method that involves a lot more pressure plus a repeat pressing on the reverse, see if that helps. 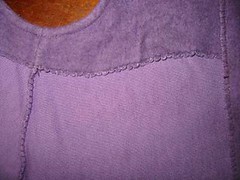 on the up side i was really pleased with the serging stitch i discovered on the machine. 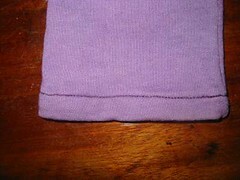 nice neat edges with so little seam allowance i was able to add it by eye. only works cos it’s a knit so doesn’t really ravel.